In 2001, Roz Feigelson was diagnosed with breast cancer and began a year of chemotherapy and radiation. During that time, she found that the therapy made her cold but that the hospital blankets were too heavy. After she went into remission, Feigelson got the idea of knitting scarves, shawls, and the like for cancer patients and their families as a way to help those fighting the disease. 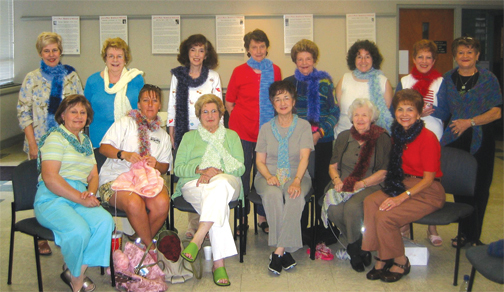 This, combined with a request from Sherrie Grunfeld, director of adults and seniors at the Levite Jewish Community Center in Birmingham, to start a knitting class, led to the development of The Circle of Life Knitting Society. The group began in August 2004 with four women, Feigelson, Lynette Slaughter, Carol Tuck, and Norma Warren. Today, anywhere from 16 to 24 women attend the weekly gathering, which is held from 10 to 11 a.m. on Tuesdays in the LJCC Gallery. The participants' ages range from 12 to over 90 years old. Although some of the knitters have been at their craft for decades, most of the participants are new to it. In fact, the secondary goal of The Circle of Life Society is to teach knitting to learners of all levels. Slaughter explains that "We've started with people who have never touched knitting needles." As Rhonda Fierman attests, "If I did it, anybody in the world could knit. And I'm left-handed." She adds that for her, knitting is the best diet plan, because if she is knitting, "I don't go to the kitchen and get food." Rita Maisel concurs, stating that she has knitted off and on for about 30 years but "always learns something. [Besides,] you can't eat and knit at the same time." Sarah Adelman, who is in her 90s, is also new to knitting. She comes to the Tuesday meetings because she likes "being with the ladies and [part of] the nice diversity." Most importantly, though, she knows that she is knitting "for a good cause." The group began by knitting stylish fuzzy scarves for female cancer patients they knew in the Jewish community; then, the knitters expanded their project. So far, says Feigelson, the Circle of Life Knitting Society has donated at least 30 scarves to Cooper Green Hospital and about 30 scarves to members of the local Jewish community or their children who live elsewhere. As each knitter finishes an item, she gives it to Feigelson, who covers the scarf in matching colored tissue, boxes and wraps it. In each box goes a note signed by the individual knitter, which reads, in part, "We want this scarf to be a reminder that your community is surrounding you with love, warmth, and hope." Janie Solomon, a nurse at Cooper Green, gives the knitters the names of cancer patients at the hospital; Carol Tuck then delivers the gifts to the hospital. In May, the knitters began a similar program with the University of Alabama at Birmingham. The only funding for this project comes from the knitting participants and other community members, who give money for supplies to Margy Rosenbaum, the group's treasurer. Of late, the knitters have switched gears slightly. Instead of winter scarves, many participants now are creating shawls, called "shrugs." Furthermore, the knitters have been expanding their circle of recipients beyond female cancer patients. For example, they have given scarves to Sam Lapidus and Rusty Radwin, who are both fighting cancer; the knitters have also given scarves to Lapidus's mother and younger sister. Many of the knitters first heard about the group in the LJCC's Senior Adult newsletter, The Joy Journal. That was the impetus for Sybil Michalove, for instance, who currently has nine grandchildren and decided she need to learn how to knit. "I love it and really am enjoying it," she said. Rebecca Davis, though, found out about The Circle of Life Knitting Society by accident. She was working on a blanket and "got stuck." After the local knitting stores could not help her, she called the LJCC to ask if they had a knitting class. Although she is not Jewish, Davis decided to come to the Center; she has enjoyed it tremendously and currently is on her second scarf for cancer patients. For Slaughter, knitting is "a stress release," while Riv Husid, a beginner, notes that "she feels empty" if she is not working on a scarf to donate. The universal sentiment of the knitters is best summarized by Joan May, who has made five scarves so far. "I enjoy it and enjoy what we're doing it for....to know we are helping somebody."